Mbarara (Agenzia Fides) - Every year in the world there are 9 thousand new cases of retinoblastoma, eye cancer. The incidence on young children is high and while in high-income countries over 90% of children with retinoblastoma survive, in the countries of the global South 70% die because they do not receive an early diagnosis and timely care. These are impressive figures if we consider that they are human lives. 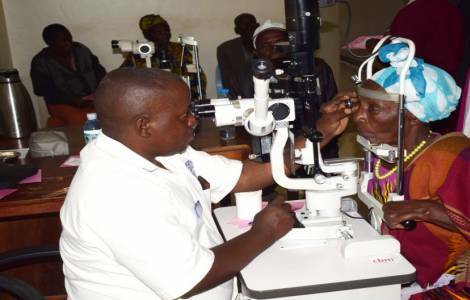 To cope with this scourge in Uganda, the diocese of Ankole together with CBM Italia Onlus has launched a national retinoblastoma prevention and treatment program at Ruharo Hospital. The diocese of Ankole, founded in 1957 in Ruharo, 3 km from Mbarara, as well as ensuring pastoral and religious activities, promotes health, educational and social assistance services for the inhabitants of Mbarara, Ibanda, Isingiro and Ntungamo. Assistance is given to the little ones, to save their lives. "In Uganda, our primary objective is to reduce the mortality of children affected by retinoblastoma by saving their sight and their lives. It is not easy, timeliness in these cases is essential to prevent the disease from spreading further. When diagnosed early and treated effectively, infant retinoblastoma is in fact curable", says Massimo Maggio, Director of CBM Italia Onlus, to Agenzia Fides. The program, launched in 2006 at the Ruharo Eye Center in Mbarara, in the south-western part of Uganda, promotes access to medical care for children by offering them a complete treatment: from identification to treatment with chemotherapy or surgery; from rehabilitation with ocular prostheses to short and long term controls. AMERICA/BOLIVIA - The Bishops: "It is urgent to respect the democratic process in the Country"